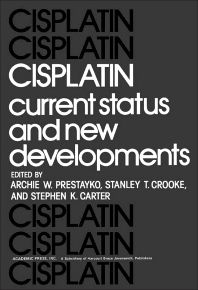 Cisplatin: Current Status and New Developments is a collection of papers presented at a symposium sponsored by the University of Alabama in Birmingham Comprehensive Cancer Center and the Bristol Laboratories in Syracuse, ?ew York, and held on September 27-28, 1979, in Atlanta, Georgia. The symposium provided a forum for assessing developments with regards to cisplatin as an anticancer drug, with emphasis on its clinical application in a wide variety of adult and pediatric malignancies as well as the mechanism by which the drug appears to cause tumor cell death. Comprised of 39 chapters, this book begins with a preclinical overview of cisplatin, focusing on its mechanism of action, pharmacology, antitumor activity, analogs, and toxicity. The discussion then turns to the effects of cisplatin on DNA and the possible relationships to cytotoxicity and mutagenicity in mammalian cells; lethal activity of platinum compounds in combination with pyrimidine derivatives; and ultrastructural effects of cisplatin. Subsequent chapters focus on the rationale of combination chemotherapy; toxic side effects of platinum analogs; radiopharmacokinetics of cisplatin; and the use of cisplatin for the treatment of malignancies such as ovarian cancer and advanced adenocarcinoma of the prostate. This monograph will be useful to oncologists and pharmacologists.